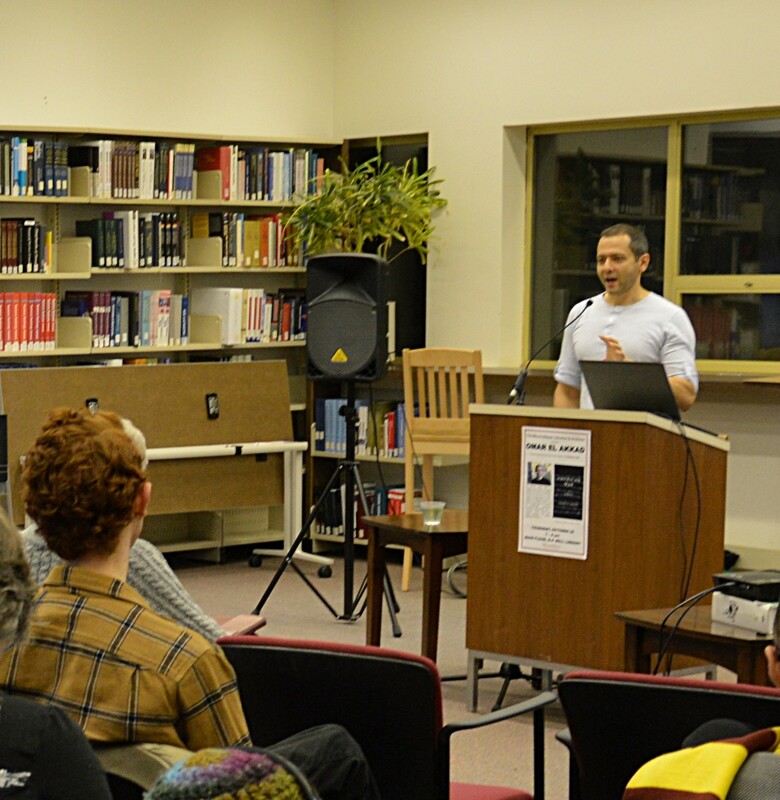 The Library's "Our Picks" author series kicked off Thursday night with a riveting talk by author and journalist Omar El Akkad. American War, El Akkad's debut novel, is a dystopian tale that draws on his ten-year career as a journalist covering the "War on Terror." Afghanistan, Guantanamo Bay, the "Toronto 18" case -- these are the assignments that starkly revealed some of the injustices and disparities that help set the scenes in American War. For El Akkad, fiction -- not journalism -- is a vehicle for exploring the deeper questions behind war and humanity. "Journalism is where you go for answers," he said. "Fiction is where you go to ask questions. Fiction, for me, has a much more permanent place in my memory than non-fiction does." University Librarian Marc Truitt introduced El Akkad by placing American War in the context of the rich genre of dystopian and post-apocalyptic literature. Click here for a list of the books Marc Truitt mentioned (and more). 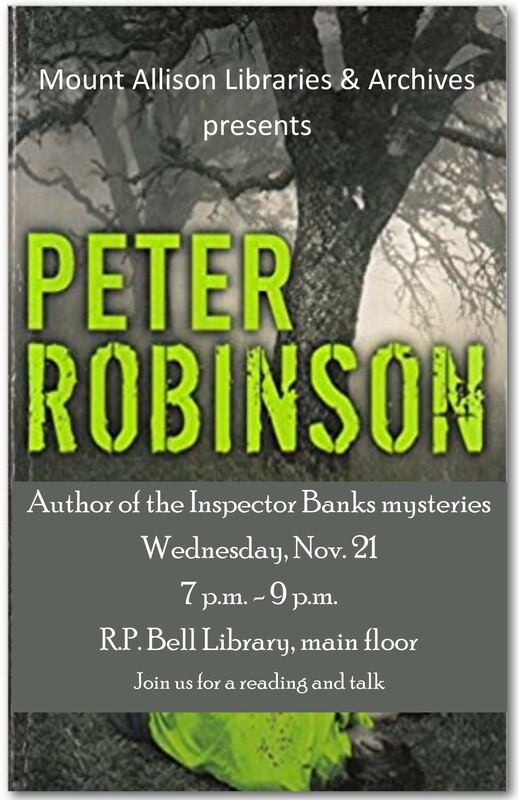 Fiction will again be centre stage when mystery writer Peter Robinson comes to the Mount A Library on November 21. Author of the acclaimed Inspector Banks series, Robinson wrote his first DCI Banks novel in 1987, and just released his 25th in the series this year. Meantime, the books have won several awards and have been translated into 19 languages. Britain's Left Bank Pictures and ITV turned the books into an award-winning TV series, which later aired on PBS. Sean Michaels, author of the Giller-Prize-winning novel Us Conductors, visits the Library on January 16, 2019. Us Conductors is a tale inspired by Russian scientist, inventor and spy Lev Termen, inventor of the theremin, and theremin player Clara Rockmore. Music is important to Michaels, who was one of the first music bloggers. His music writing has appeared in Walrus and the Guardian. We hope to have a theremin at Sean Michaels's talk so attendees can hear its other-worldly sounds echoing through the stacks. Our final writer of the 2018-19 Our Picks series is Katherena Vermette, author of The Break, an intergenerational family saga set in Winnipeg. The Break tells the story of a young Métis mother and her extended family; a homeless teen in trouble with the law; and a young Métis police officer. It was a CBC Canada Reads finalist and winner of the Amazon.ca First Novel Award in 2017. Vermette will speak in the Library on Feb. 6. She'll also join her colleague Erika MacPherson for a screening of This River, a short documentary directed by Vermette and MacPherson. The documentary, released in 2016, focuses on missing and murdered Indigenous women. We'll have more details about the dates and times of the film screening closer to the New Year. Stay tuned for more information about each event. Follow us on Twitter or Facebook @MountAllisonLibraries for event details, or check our website.